EDGE gives the user several options to print data. Data/forms can be printed individually from each Tab, by use of the Print button in the View ribbon. All forms will be printed in PDF format. 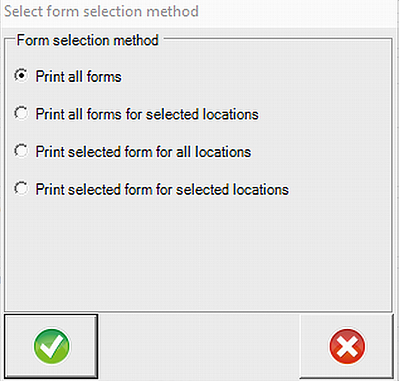 EDGE offers several options to modify the form printing. Control border hiding: Removes all borders from controls when printing. Control feature hiding: Removes any drop-downs from controls when printing. Make Control black white: Makes the control black and white removing any background gray or colors. The multiple forms printing options are managed by the File Export Feature, which will export multiple forms at once. Note that if specifically printing a Facility Parameter or Safety Form (which are task dependent forms), the printing feature is linked to the selected task as opposed to the location. Clicking on the File Export Feature will bring up a variety of options. The forms will be printed per the selected option. After the printing process is complete, the file location where the PDFs were created is automatically open. All forms support auto sizing, The user only needs to adjust the width when printing in order to take advantage of the full width of the print page.